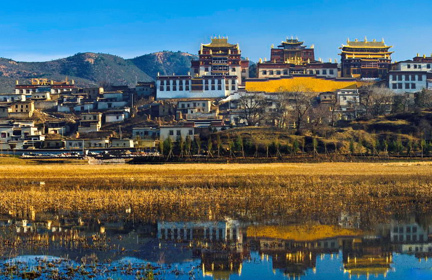 Tour Overview: This 13-day tour starts at the Tibetan area of Yunnan province from Shangri-la (Diqing) and ends at Dali, focusing on the world famous places in southwest of China. 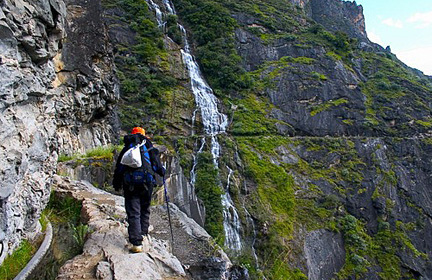 The tour includes the Tibetan culture visit at Shangri-la, amazing trekking on Tiger Leaping Gorge, biking into the most beautiful region on the Yunnan-Tibet border. 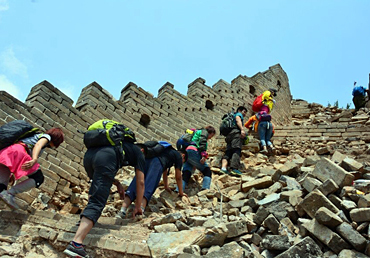 White water Terraces, countryside of Eyuan, brooks and waterfalls at the gorge, the iconic snow mountains Yulong and Haba, Liiang ancient town, Erhai Lake and ancient cities will be explored. 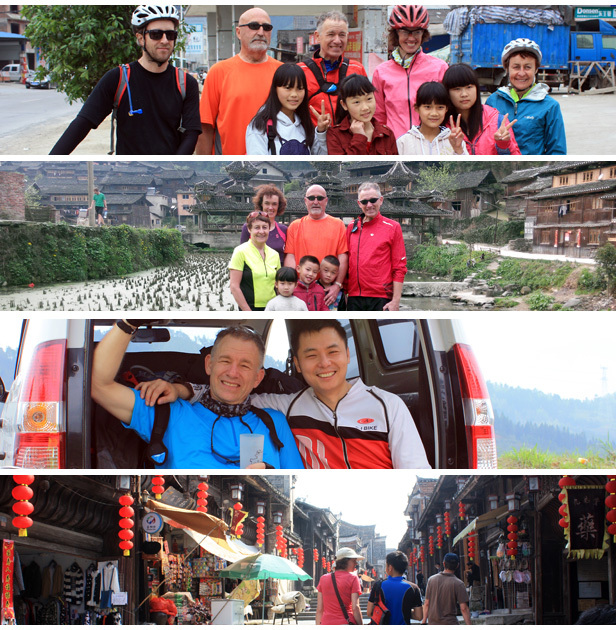 Let us take you to see the Alpine mountains of China version and experience the colorful cultures of different ethnic groups along your biking route. Duration: 9+1 cycling and visit days,1 rest day. Arrive at Shangri-la by flight arranged by yourself. The best transit airport to Shangri-La is Kunming, the capital of Yunnan Province. It is only 1 hour flight between the two cities. 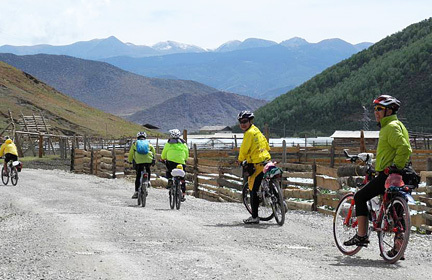 The Yunan cycling tour begins in Shangri-la (formerly known as Zhongdian) At an altitude of 3200m Shangrila is located in the Tibetan region of China. 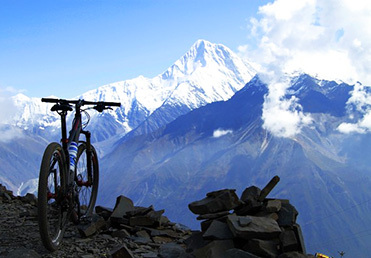 We may face more difficulties physically and spiritually than usual while cycling on high mountainous areas. To guarantee a safe return, we are supposed to make good preparations. An easy relaxing day for acclimation is suggested. 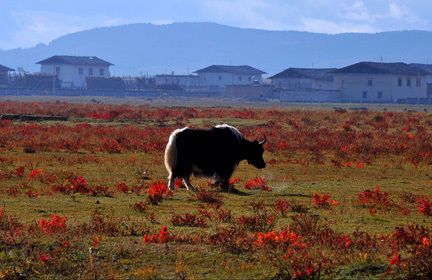 Have a warming up ride in the afternoon on the famous Napahai grassland and lake, then visit Dukezhong Ancient town, which is the best place to know about Tibetan culture during the whole trip. We will aclimatise today and have time to visit the 17th Century Sumtsenling Garden Monastery which is home to over 600 monks: a smaller but no less magnificent version of the grand Potala Palace in Lhasa. We begin with a short transfer out of town, passing through arid plateau on towards Pudacuo National Park where the day’s point to point cycling begins. 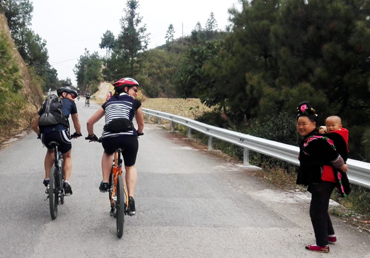 We set off on the bikes with a downhill stretch on good road and continue during the day to cycle a series of valleys and mountains through a changing rural scenery gradually descending to the village of Bai Shui Tai. Our final stretch of the route brings us through conifer forest. 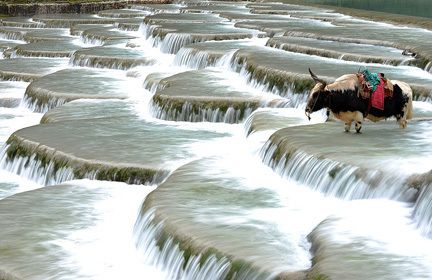 Located below the Haba Snow Mountain (the other side of Tiger Leaping Gorge), Bai Shui Tai is famed for its natural mineral terraced White Water Tables created by calcium carbonate deposits from the melting mountain spring water. We set off today with a few gentle hills before challenging a more serious climb. Once we reach the top of the pass we will have views of the stunning Haba Mountain peaks. The highest point is at a dizzying 5,396m. With alpine moraine lake, endless clusters of azalea and waterfalls cascading down snow-covered cliffs, the glacier on the Haba Snow Mountain is the southmost glacier in China. We make a short descent into Haba village, whose resident minorities include Naxi, Hui (Muslim) and Yi peoples, as well as a few Tibetans. This afternoon we climb to our next pass then cycle down into the Yangtze River Valley. 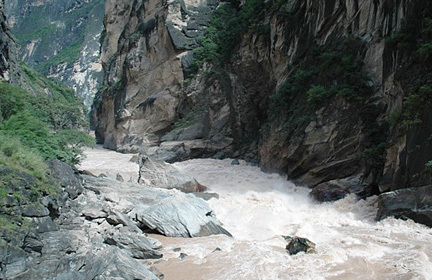 At the village of Yonke we turn into the legendary Tiger Leaping Gorge, one of the world’s deepest ravines. Cutting its path between Haba Mountain and Jade Dragon Snow Mountain your surroundings will be as dramatic as the place names suggest. We cycle to the mouth of the gorge. Here we’ll see the famed Tiger leaping boulder where the pounding waters swirl dramatically and legend has it that the mythical big cat crossed the river. You can opt to hike to the river bend (approximately 1 hour) before we retrace our steps to the guest house for lunch. This afternoon we cycle out of the gorge to cross the Yangtse by ferry to reach Daju. 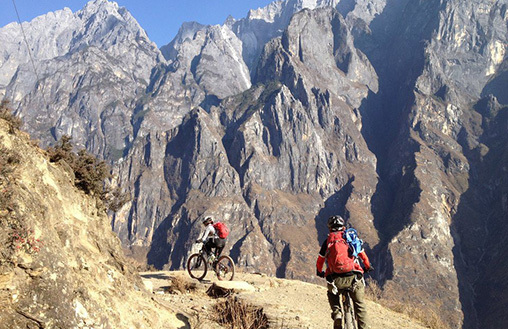 We begin the day with a 15km climb as we cycle towards Jade Dragon Snow Mountain. Snow-capped and often shrouded in mist, Dragon Snow Mountain is a sanctuary for rare animals and wild plants with unique micro climates on the different slopes. It is also known as a natural glacier museum and is now a famous scenic spot for tourists and scientific research. We ride up over the pass with a long 1475m climb up the southern slope of the Dragon Snow Mountain for 31km to the top. We then enjoy a long downhill ride through another valley. We end the day with another short climb to Da Dong. We can relax in hot springs this evening. A great tonic for tired legs. We set off this morning cycling uphill through a forest of pine for the first 15km. The route continues along undulating road across the plateau for 27km as we enjoy the surrounding mountain scenery. We join a bigger road for the final 22km to reach Lijiang along flat fast road. 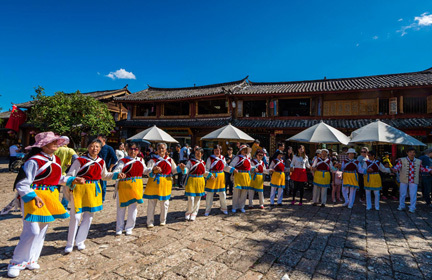 Surrounded by magnificent mountain scenery Lijiang old town is a well-preserved city of diverse ethnic minorities, rich in traditional culture. With narrow streets and traditional buildings, the Old Town is built along the lie of mountains and the flow of rivers. We have a day off the bikes to wander the cobbled lanes, learn about Naxi culture and marvel at the detail and blend of architectural influences in the town. The stone bridges and intricately carved buildings lead away from a central square in four directions which ever way you wander you'll follow lanes decoratively decked in traditional lanterns and an array of flowers. Lijiang is as famous as Yangshuo of Guilin in China so it is commercialized and crowded with lot of shops, bars and tourists. 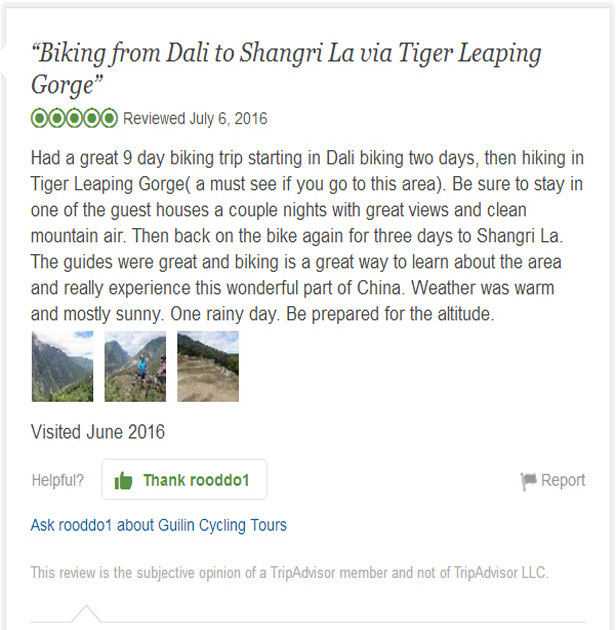 Therefore, GuilinCyclingTours arrange an half day staying there and we continue our trip driving to Shaxi Ancient Town located 90KM from Lijiang, to enjoy a more peaceful and quiet holiday. 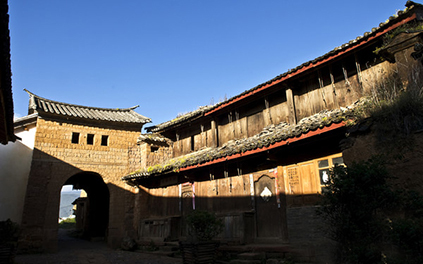 Shaxi is a town of great Chinese history over 2400 years. It was one of the main headstreams of bronze smelting culture and was a very important town for merchants and culture exchanges between our ancestors from Tang dynasty and the Tibetan regime in ancient China. 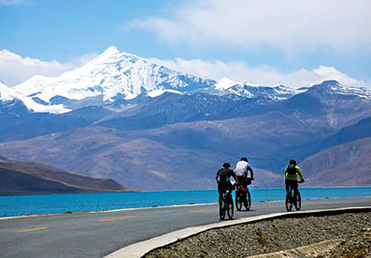 Leaving Lijiang we cycle a gentle 8km to reach the beautiful Lashi Lake (New Basin) a nature reserve rich in biodiversity. The endangered black necked crane can be seen here. The Naxi and Yi minorities live in this area. We ride through a scenery of potato crops and apple orchards. A further 7km takes us up to the pass (2900m) through more fields and pine forest. and the white towering peaks of Jade Dragon Snow Mountain come into view. Over the pass we ride 7km downhill to join road 214 which will take us to Jianchuan. There is time to wander the streets of the old town with its quaint bridges and canals. This morning we set off following the undulating 214 road through the valley along the old Tibet highway. There is little in the way of traffic and toward the end of today’s ride we journey through a forest of Eucalyptus and Conifers to reach the traditional Shaxi village. 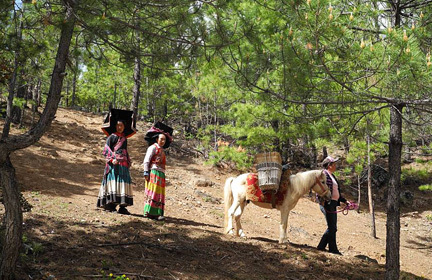 Known as 'the last Tea Horse town', Shaxi village is home of the Bai people, a matriarchal community where children take their mother’s name. Shaxi ancient town is also well-known for another scenic spot nearby - Shibaoshan (means a hill with rocks and treasures in Chinese). We will trek Shibaoshan Mountain today. The rocky treasure here is the unique Danxia landform rocks on the mountain. 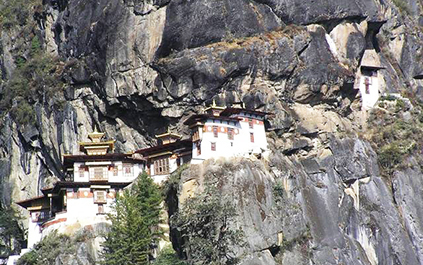 Beside the rocks, the forests, animals only existing on highland mountains over 2000-3000 meters, the specific grottos, the stone carvings, temples and giant Buddha on the mountain will definitely make our eyes and pace slower. 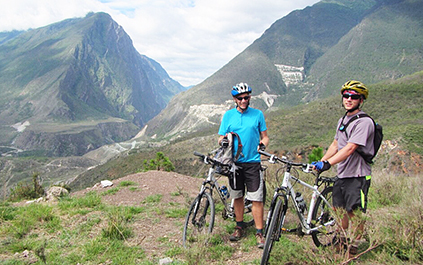 Enjoy the trekking and rest before another cycling day. 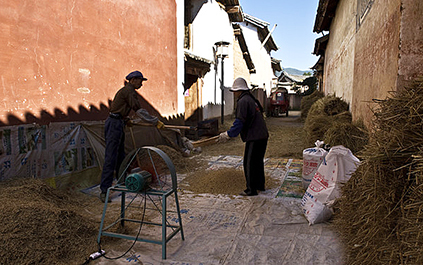 Shaxi is a well preserved historic stopping point on the Tea Horse route. 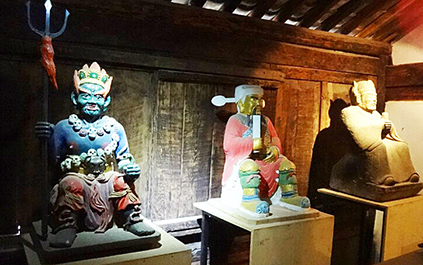 In the old town square, you will find a traditional wooden temple with cobblestoned quadrangle. In the past, it has been relatively inaccessible to visitors and thus has not become modernized. Efforts are now underway to preserve its historic identity. With more sunshine, annually than California the area has rich natural biodiversity. Victorian botanists and flower hunters were drawn here to collect specimens for the ornamental gardens of Europe and America including orchids, roses, rhododendrons, azaleas, and magnolias, to name but a few. There is an interesting Caravan museum in the town. On the outskirts of Shaxi you can enjoy views of the Heihui River, with rolling peaks in the background. An ancient crescent shaped stone bridge connects the town to the fields over the river. There are local options for horse riding, another way to explore your beautiful surroundings. We leave Shaxi continuing along the historic and once busy tea horse route, enjoying beautiful scenery. Horse caravans transported tea and salt between villages travelling as far as Tibet and India. 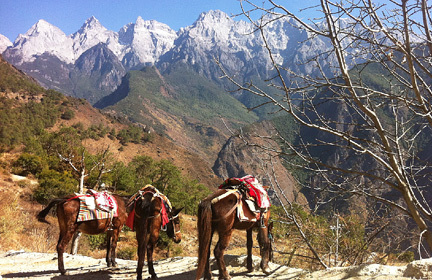 It was named the tea horse road because of the common trade of Tibetan ponies for Chinese tea. We will follow the Heihui River and pass through some interesting villages. We have a fast and easy ride for 47 km, to Liantie Town, where we stop for lunch. 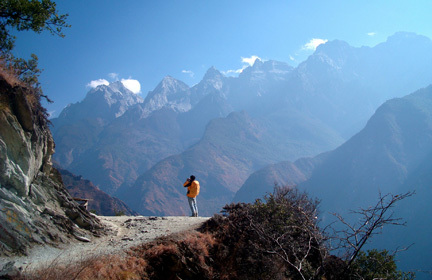 This afternoon we head off to climb a tough but scenic 22km up Chang Shen mountain taking us to the pass at 3,022m. (The support vehicle is on hand should you need it!) 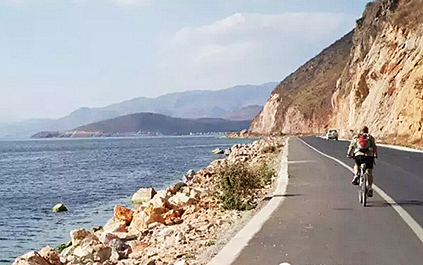 There is an exhilarating 22km downhill on the other side, though we need to take care over the rough surfaced road. We ride another 10 km to reach Eryuan. We set off for our last day on the bikes as we head to the historical town of Dali. 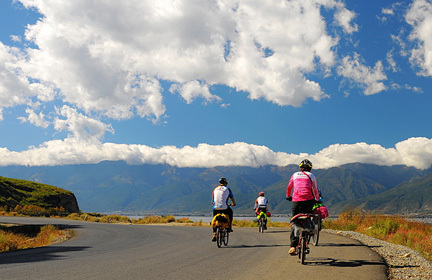 We cycle along a flat paved road between the towering Canshan Mountain range and Er Hai Lak. One of China’s largest freshwaters Er Hai is an alpine fault lake. Its name means "Ear-shaped Sea". 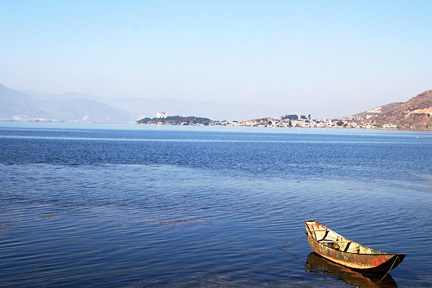 Our final destination is the lakeside town of Dali. With gated city walls, bustling cobbled streets, and colourful markets. Dali historically is home to the Bai people, and was the centre of the 8th-century Nanzhao Kingdom. In the 16th century it was an important gateway to south east Asian countries. Today, it is characterised by many different ethnic groups, distinct architecture, cobbled streets and colourful markets. Once we have checked in to our hotel we will pack up the bikes before gathering for a celebratory farewell evening to mark the end of our Yunnan adventure. The tour ends this morning. You will be transferred today to the airport for your journey home. Dates: 31th March - 12th, 2019. 6th - 17th Oct. 2019.